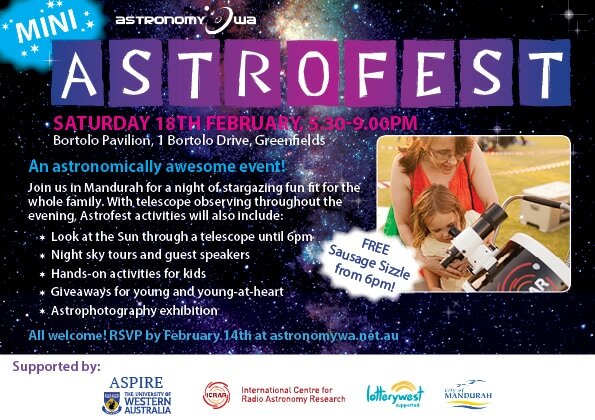 Join us on February 18th at the Bortolo Pavilion for a mini Astrofest! All welcome! RSVP by February 14th below. RSVP your attendance at the Mandurah Mini Astrofest, February 18th 2017. ​All are welcome, even if you haven't RSVP'd by the event day. This is to give us an idea of numbers so we cater enough for the free Sausage Sizzle. This is how many people will be coming to the mini Astrofest, including yourself and any children. We will use this to remind you about the event, but won't subscribe you to any email lists and won't share your details with anyone else. This is to give us a list of who is coming, but you won't need a ticket and won't need to be signed off a list at the event. All are welcome!